If you follow Hike 734 you are probably aware that Jake is currently hiking and exploring Olympic National Park in Washington. Although I’d love to join him on this adventure, my full-time job as a Diagnostic Medical Sonographer and some lingering limitations from the long recovery process of a fractured foot is keeping me close to home for the time being. Fortunately, I’m lucky enough to have Glacier Park as my “backyard” playground! So a couple of girlfriends and I took advantage of the sunshine filled weekend and got some Glacier dirt under our feet. It’s mid July (*GASP*…summer please slow down!) and the snow in the high country is melting quickly and trail crews have been busy clearing many of our favorite trails, but we decided to do a hike that the three of us had not done before. We were also looking to avoid crowds of people, so we chose a less frequented area of the park. Medicine Grizzly Lake is located in the Cut Bank drainage. We’ve seen this lake several times from high above at Triple Divide Pass, so we decided to check it out from its shoreline. 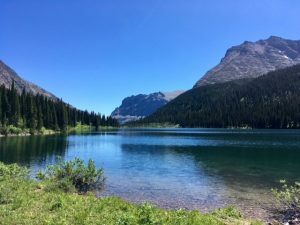 The level trail takes you alongside a beautiful creek and through gorgeous flower-filled meadows to a picturesque lake backdropped by rocky, mountain peaks laced with waterfalls. 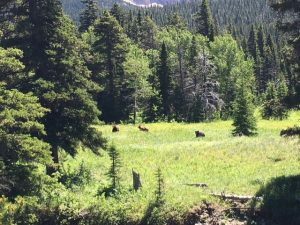 This area of the park provides great habitat for moose and bear (we saw three bears grazing in a grassy meadow along the creek), and if fishing is your thing make sure to bring your pole (we saw lots of fish rising in the lake)! Once at Medicine Grizzly Lake, I recommend continuing on to the head of the lake. From there, you will have a different vantage of the lake and surrounding peaks, see more waterfalls, and find a nice place to sit and enjoy a snack, breath deeply of the mountain air, and just take it all in! On a side note, I’m planning on contributing to the Hike 734 site more regularly with posts specific to healthy eating/recipes (especially those I enjoy taking with me on the trail), motivation for staying fit, tools for living a healthy and active lifestyle, and hiking from a female prospective. So be on the lookout for more to come! That being said, I’d love to hear your thoughts and requests on topics and questions I can discuss with you. Stay active, get outside, and enjoy a bit of nature this week! Jodi, the hike is about 13 miles round trip. We absolutely love this hike! I enjoy the solitude and my husband loves the fishing! Highly recommend this hike! Backpacking in that area next weekend. Haven’t been to Medicine Grizzly yet. Enjoy your trip Leah! Looking forward to seeing photos of your adventure. 6 Mississippi folks did this trail July 11th, beautiful hike, beautiful lake, disappointed we didn’t see the bears. My husband and I just ran into Jake while hiking along the ONP Coast! From a Mrs. to another Mrs. he’s doing well. We enjoyed a long conversation with him while taking a break at Wedding Rocks. I’m looking forward to reading your perspective as well as Jakes! I’m always looking for new and improved ideas on healthy eating while in the backcountry. We visited Glacier last August and stayed at Cut Bank for about a week and a half. We never made it to Medicine Grizzly Lake but it was on our “to do” list if we had time to squeeze it in. I guess it gives us a good reason to go back. Hope your foot/ankle heals completely before long! Hope you are enjoying your travels in ONP! 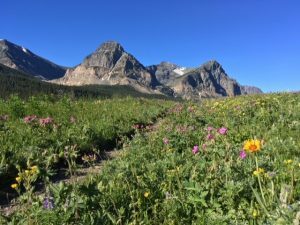 Be sure to let us know when you plan to visit Glacier again and maybe we can coordinate a hike together. We just received your Yosemite map in the mail and we are VERY happy with it! Jake may have just cut out a ton of research for our visit there in a few weeks. With the quality and amount of great information provided on the maps, we can’t figure why your map isn’t in stores…or are they and we have overlooked them? The Yosemite maps were hot off the press this year in June and we are still working on getting the distribution in order. Hopefully we will be filling the shelves of stores very soon! Great report. In your opinion, which is better Medicine Grizzly Lake hike or Triple Divide Pass hike out and back? Headed to GNP next summer and want to do this hike! In my opinion the hike out and back to Triple Divide Pass would rank higher than Medicine Grizzly Lake… only because I’m partial to the expansive views you get from passes and summits. Keep in mind that the hike to the pass is a longer distance and more elevation gain/loss. We are going to Glacier the first week of August and are interested in the Two Medicine area. Someone had said to us this area was not as breathtaking but it looks good to me. Can you tell us another hike that is beautiful etc like this one you just did but half that long ? Also thanks for sending the maps to us so quickly. In the Two Medicine area I’d also recommend the Scenic Point trail. It is 7.9 miles round trip, however, keep in mind it has 2.300 ft elevation gain/loss. If you are looking for something with less elevation, then Rockwell Falls would be a great option for you as well as it is 6.6 miles round trip and mostly level. I love the idea of a female perspective, as well as the healthy eating tips to come! This North Dakotan has been making the trek to the Flathead Valley of Montana for the past 12 years, but I may not be able to manage it this year. A Fall trip is possible, but I may not get as far as Glacier. I will miss it & my <3 will miss it. A group of us Fort Worth Texans are hiking Glacier from Aug 2 to 11. I turned in our Itineray last week. On the NG map, there was no camping symbol at MG Lake. Your map seems to show a camp symbol. Is there camping at MG Lake? The campsite is near Medicine Grizzly. It’s called Atlantic Creek. It’s nothing special, but is a good way to make a sweet itinerary.